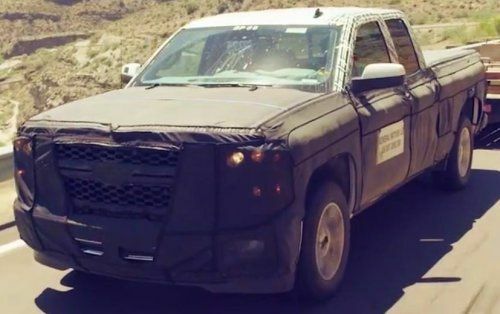 This morning, General Motors issued a brief statement proclaiming that their engineers are currently putting the next generation Chevrolet Silverado through the final testing processes at their company proving grounds in Yuma Arizona – including a short video of the new Chevy pickup all masked up, driving on the open road. General Motors’ statement this morning offered very little information shy of the fact that the next generation Chevrolet Silverado pickup is in the final stages of testing and that it will reach production sometime in 2013 as a 2014 model year vehicle. However, based on the video provided by GM of the new Silverado towing a loaded trailer on the open road – we can look at some possible changes coming for the next Chevy pickup. We have captured the screenshot shown on the right side, with a good look at the next generation Chevrolet Silverado front end and side profile even though there is some significant masking covering just about everything but the greenhouse. Everyone should keep in mind that the truck shown in the video below and the image on the right is clad in all sorts of items that might not make production. However, there are some key features that appear to be similar and some others that appear to be different. First off, the front end of the 2014 Chevrolet Silverado appears to maintain the very upright design with a large, flat, bold front end design that we see on the current Silverado. It looks as though the truck being tested has a larger upper and lower grille opening along with a new lower front lip that has a raised section in the middle whereas the current Chevy truck has a straight plastic lip along the lower front end. Based on the dual openings low in the front bumper area, it looks as though the design of the front bumper/fascia may change for 2014 although it looks as though the fog lights will continue on with the rectangular design, set towards the outer edge of the lower front fascia. There is also a set of projection headlights behind the mesh cladding but it is common for mule vehicles to have projection lights that don’t make it through to production. Along the sides of the 2014 Chevrolet Silverado test vehicle, we see plenty of cladding that seems to extend out away from the body – suggesting that the next generation Silverado will have a similar flared design in the front fenders and through the bedsides that we see in the current Silverado. It looks like the point where the roof meets the windshield might have a slightly harder angle with that sharpened corner echoed through the front windows as well. It also appears as though the new Silverado will have larger rectangular mirrors in place of the oval mirrors on the current Chevy pickups. There is also a short portion of the video that shows the back end of the next generation Chevrolet Silverado being tested but with the trailer in the way and the heavy masking – it is hard to get a good look at any changes to the 2014 Chevy pickup. The test vehicle appears to have LED taillights with distinct separate lights but much like the headlights – the lights out back could just be mocked up for testing. Check out the video below for a look at the 2014 Chevrolet Silverado in motion and stay tuned to TorqueNews for future news on the next generation Chevy pickup!